Preparing and implementing a successful enterprise mobility program can help save your organisation a great deal. New enterprise mobility program managers are often surprised to learn just how complex and intricately intertwined the processes and tasks can be for a successful program. It doesn’t take much to accidentally overlook a critical piece of the mobility puzzle. Even the most experienced enterprise mobility program manager is susceptible to a gap in the process or the occasional incomplete task. Just as both new and experienced airline pilots need to complete a pre-flight checklist to ensure a safe flight, enterprise mobility program managers need to consider a list of basic themes that help to ensure a successful and secure program. International roaming is responsible for more carrier bill shock than any other line item. If your users’ devices are not enabled with international features or plans, employees can quickly rack up bills in the hundreds, thousands, or even tens of thousands of dollars while on trips abroad. Knowing when employees are traveling, finding the right international features, and educating employees on how to use mobility overseas pays off. To combat international roaming fees, some organizations enable international features on every employee’s device, which of course, also raises the monthly average cost per device. A Mobility Management Platform (MMP) is a software-first solution that empowers enterprises by centralizing, controlling, and comprehending all mobility program data and tasks. An MMP enables an enterprise to integrate with a company’s travel booking database so that whenever an employee books international travel, an activity is created in the MMP software to automatically add relevant international features for those travel dates and destinations. By making these changes, a company with 7,000 employees could save more than $750,000 in one year. Often, when an employee leaves a company, his device is handed over to a manager and dropped in a desk, never to be used again. Carriers love these zombie devices because although they’re continually billed for services each month, the devices and plans remain unused. Of course, there are always exceptions to the rules—employees on sabbatical or maternity leave and emergency response lines that must be maintained, for example. Knowing when these lines should be suspended or cancelled is another important consideration. Imagine a new mobility program manager comes into an organization where devices are tracked using an Excel spreadsheet and any excess inventory is stored in her office. She inherits a drawer full of devices and is told that they’re extras. Naturally, the program manager has no way of knowing who was previously responsible for the devices. And, because the previous program manager was a little lax in tracking changes his last few months, she can’t even tell what line of service was connected to each device. When the monthly bill arrives, charges are detailed by line of service, but matching lines to users and individual devices is next to impossible. Imagine the program manager’s surprise when, once an MMP is implemented, she finds out that the organization has been paying for voice and data plans on 15 of the unused devices sitting in her office—for three years. With an average monthly cost per device of $65, that’s more than $35,000 in unnecessary mobile spend. With today’s technology, there are several ways in which an MMP can be enhanced to allow end users to troubleshoot on their own, a.k.a. self-service. Wiki-like databases and chatbots are just a couple of these technologies. Enabling a system that allows end users to self-service their own issues while reminding them of corporate wireless, usage, and security policies is ideal for relieving pressure on internal IT resources and maintaining a high end-user satisfaction rate. One company going through a large migration project from BlackBerry devices to Apple devices found themselves in hot water when the devices arrived with instructions on how to configure the device, but no power cords. It wasn’t long before the IT team was flooded with phone calls and angry emails from employees wondering how they were supposed to charge their iPhones without a power cord. Enabling an MMP, the organization was able to provide self-service options for employees, empowering them to search for answers to frequently asked questions, place device and/or accessory orders, assign new lines of service, and even submit service desk tickets they were unable to troubleshoot via self-service. This program change drastically reduced the number of support calls received by the IT team, allowing them to focus on more strategic initiatives for the organization instead. If you ask most enterprise mobility managers what keeps them up at night, they’ll quickly reply, “security.” Employees walk around with easily misplaced devices that contain sensitive corporate data and provide network access. From email to apps to files, each provides a vulnerability that could easily be exposed. Policy control, Enterprise Mobility Management (EMM), hardware management, software updates, and more are all required to properly manage mobility security. It’s imperative that companies keep all these moving parts monitored and current. When it comes to EMM, purchasing licenses for your employees isn’t enough. 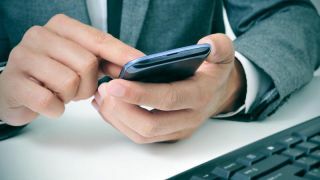 This is an extremely common issue in today’s enterprise—Mobile Device Management (MDM) licenses will be purchased for end users, but there is no effective policy in place to enforce installation or ensure the software remains installed and active on the device. An MMP allows an organization to house its carrier and MDM/EMM data in one platform, empowering administrators to push software updates to devices and providing them with visibility into the ever-changing mobility ecosystem for which they are responsible—including the ability to see who is or is not compliant with security policies. These are just a few of the many themes to consider when running a successful and secure corporate mobility program. It’s a lot of moving parts, and if you miss even one theme on this list, it could lead to huge cost, efficiency, employee engagement, and/or security consequences.